When it hits the fan and your life is on the line, the last thing you want to have on your hip is a gimmicky concealed carry holster made of cheap plastic with parts that may fail you in a time of crisis. You need a gun holster as reliable as the firearm you trust, that also helps your gun disappear in comfort when you conceal it from prying eyes. The JM4 Tactical Quick Click & Carry is the first ever, and only, Magnetic Retention concealed carry holster that provides you with a way to carry your firearm no matter what you wear from jeans and dress pants, to active wear like shorts and yoga pants. The Original Quick Click & Carry leather gun holster allows you to be armed without the hassle of belts or clips that can damage your clothing while maintaining a level of unprecedented comfort. The Quick Click & Carry Holster is designed to be worn for hours at a time, and forgotten about until needed no matter what you’re wearing, or what you’re doing. Going for a jog? Hitting the gym? Sitting at the computer desk? The patented JM4 Tactical holster has you covered, no matter where life takes you. Historically, gun holsters had only men in mind with their design. But the Quick Click & Carry is great for both men and women who wish to arm themselves in comfort, convenience, and the deep concealment that can only be found with this magnetic holster. These leather pistol and revolver holsters are made with two layers of stitched Hermann Oak Grade A Vegetable Tanned Steer Hide that is PH balanced for extended contact with your gun. In other words, you’ll never need to worry about damaging your gun’s finish. JM4 Tactical’s patented Leather Holsters are different than everything else available on the market which can be seen in the quality of the materials. Only the finest leathers, the best threads for stitching, and dual-purpose rare earth magnets are used in each one. Furthermore, the Original Quick Click & Carry uses no hard plastic from injected molds known to damage a firearm’s finish, nor does it use metal or plastic clips that could damage your clothing. The first function of these magnets is to click into place on your waistband. This allows these concealed carry holsters to stay right where you put them, anywhere on your waist. The second function, is that of magnetic gun holster retention. What this means is that once your gun is in this leather gun holster, it won’t come out unless you want it to. The JM4 Tactical Leather Gun Holsters are available for just about every size gun you can think of. It doesn’t matter if you need a 1911 holster, one for a Glock 19, or a Sig P938 pocket pistol, there is one for you no matter the size of your self-defense gun. When you buy a JM4 Tactical product, you’re supporting a Marine Veteran-owned American small business. All of JM4 Tactical’s products are made right here in the USA, by American patriots. That means when you buy a JM4 Tactical gun holster, you help feed one of the American families they employ. You trust your gun to protect your life, isn’t it about time you began to trust your holster? Change the way you carry buy adding comfort to your concealment. Buy a JM4 Tactical Quick Click & Carry Gun Holster, today. With the exception of the original large ALL of our Quick, Click, & Carry holsters come standard with a sweat guard. These are more pronounced with the sizes above the large. Please refer to generated image once you have selected your size, color (if applicable), and hand. The image will be the specified item you are purchasing. *Due to the additional supplies needed to achieve different colored gun holsters, the colored holsters are priced $15 more than the basic tan. **To keep our holsters as comfortable as possible, we don’t apply a sealant to the black or brown IWB holsters, therefore the color may bleed onto the skin or your clothing during the first couple uses. This will diminish after time. ***The teal, purple, and pink concealed carry holsters are made with two different leathers stitched together with only the Hermann Oak Grade A Vegetable Tanned Steer Hide contacting the firearm you trust your life with, ensuring that your bluing is protected and no hard plastics hurt your gun’s finish. ****We do offer a 10 day money back guarantee so buy with confidence. Just what I was looking for to carry on warm days with no belt. Perfect! I've had this holster about 2 weeks for my HK vp9sk. This is one of the most comfortable holsters I've ever used, You can sit stand run in any clothing that you want to wear. If you wanna wear nothing but you underwear and carry your pistol this is the holster for you. I have 2 of these holsters and highly recommend! They are comfortable and you can wear without a belt. Perfect for skirts, skorts, and summer wear. They do take practice to draw but are very concealable. Love them! It's perfect. I have a Ruger 9mm, and it fits exactly as it should. The Magnet is a great feature. Highly recommend! This is just what I was looking for, great for summertime carry when I am in shorts with no belt or in the vehicle. Very very comfortable!! As most here have stated, I too have far too many concealed holsters than I care to admit. Never finding one to fit my needs, until I found the jm4 quick click, that was the game changer. I can carry all day in comfort, I have bought another for a second gun, will eventually get one for every pistol I own. Have gone as far as loaning out the holster to friends to drive home how great these holsters really are. Wether you carry it appendix, 3 o’clock, 6 o’clock, or even boot, this is a great holster. 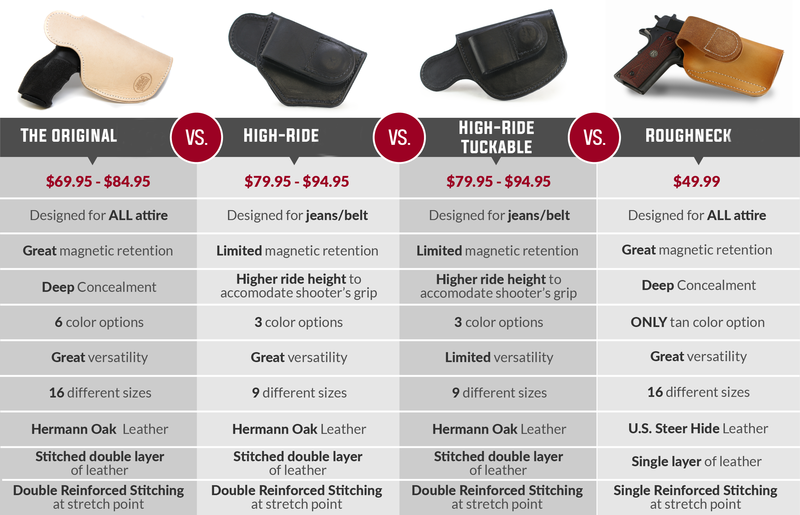 You can go from gym shorts, jeans, and leather boot, the magnet on this holster holds it very well! I love it, and would recommend it to everyone! The Jm4 team is great with communicating if you have any questions on sizing, or breaking it in. The leather on this holster is super nice and durable. 5 stars all the way! I’ve had a couple other holsters that I constantly struggled with this came through my FB feed and I read the reviews and decided to order for my .380 conceal weapon. I LOVE it! It fists my weapon perfectly. It fits on my hip or in my boot without any issues. The magnet is extremely strong so once you get it where you want it, it stays in place. I’m so glad that I invested in this holster and will now get another for my hubby. Exactly what I expected....and wanted/NEEDED. I'm currently carrying a 3rd Gen. Glock 19. I wanted to wait a couple of weeks before I reviewed this holster so I could get a better feeling for it in everyday use. I've been carrying concealed for about 8 years now. I have a cabinet full of different conceal holsters that just never really fit the bill in what I was looking for. For the last 3-4 years I've been using a holster that just tucks into the waist band with no retention system other than it being "sticky" on the outside and smooth on the inside to draw the weapon. I found it to be comfortable but I hated that it had no physical retention. I had been eyeing JM4 holsters for some time now. The appeal of the leather and the ease and simplicity of it's function finally won me over. At first appearance I thought it would have been a thicker leather which I'm glad it's not. It seems to be the perfect thickness. Thin enough to form and bend where you need it, yet thick enough to be strong and sturdy wile protecting the trigger. It's a great looking leather as well. It's comfortable enough to wear while seated in the appendix carry position for short trips in the vehicle. If I'll be seated for a long time it's also easy to move to hip without much effort at all. It's also nice to be able to just slip it on before getting out of my vehicle while in the seated position. Using a stall in public restrooms, I used to either place my weapon on the TP holder or just leave it in my pants/shorts between my ankles. Now if the stalls are metal I can just stick it to the wall until I'm ready to go. Also at work, my desk is metal underneath, so I'm able to stick it under there while staying comfortable all day long. I had stopped carrying at work because I just couldn't find a comfortable position while seated for 9+ hours a day. I work for a local Utility Company and we're open to the public and from time to time have irate customers in the front lobby. Now I'm back carrying at work again. Thanks JM4. I also love that I can carry while wearing gym shorts with little worry of it slipping down. On a funnier note, I have to laugh when random metal objects stick to the magnets like my seat belt clip, keys, pocket knife, shopping carts, or a metal chairs. I was dumbfounded when I thought I lost my pocket knife in my Jeep but was humorously relieved when I found it stuck to my waist a few minutes later. I am looking forward to many years of service out of this holster. Thanks JM4 for making it easier and more comfortable to carry in more situations than I could before. I would definitely recommend to anyone.